The earliest records found for schools in southern Illinois are those for subscription schools. They were operated under contracts with parents who agreed to pay the teacher a stated amount for each pupil sent. One of these old contracts, found in Broughton, shows that in 1823 J.W. Dewees agreed to teach a subscription school in the vicinity of the now vanished village of Rectorville, in southeastern Hamilton County. So far as available records indicate, this was the first school in that vicinity. Fragmentary records and tradition indicate that this practice of conducting schools on a subscription basis continued for many years. In 1838 a number of men living in that same section decided to organize a school district. 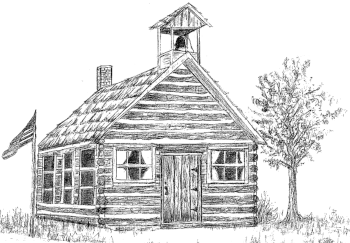 They did so and built a log schoolhouse on the east side of the north-south roadway. The newer portion of the Gholson Cemetery, about a mile south and a half mile east of Broughton, now occupies the site of the school. The house they erected served several generations of local youth. When it became inadequate, a new one was built about a mile to the northwest, where the village was growing up. The old building was sold to a local farmer who removed it a short distance to the southwest and used it as a residence. After many years of use in its second location, it was again sold and removed, this time to a place one-fourth mile north and one-fourth mile west of the place where State Highway No. 142 crosses the Hamilton-Saline county line. It remained there during the rest of its existence. In its third location it continued to be used as a residence, being occupied in succession by a number of families. The last person to occupy it was Frank Dillsworth, who was living there in the 1930s. After Dillsworth’s departure, it was used for storage of baled hay, corn, and farm equipment until it was torn down in 1943. Many older persons knew of the school and something of its history, but it was during a visit in the 1920s of a very old man who had been a pupil there during its earlier years that many details concerning it were learned. This visitor was a Mr. John Harkrider, past ninety years old, whose home was in Arkansas. He had returned to the vicinity of Broughton to visit relatives and friends and was a Gholson Cemetery on Decoration Day. While there, he pointed out the locations of the homes of several early settlers as well as other landmarks. Among objects he recognized was a large oak tree which marked the site of the schoolhouse built in 1838. He continued for some time to reminisce about the log school. Another old man who knew something of the story of the school asked Mr. Harkrider if he would like to see it again. His delight in the thought of such an opportunity was evident. A group of persons accordingly drove the mile or so necessary to the old house, still in use as a residence. Once there, Mr. Harkrider spent considerable time in describing the interior of the building as it was during the days when he attended classes in it. He pointed to hold in the wall where pegs once were inserted to hold two writing desks, one for larger and one for smaller pupils. Attention also was called to two other holes beside the door for pegs that supported a smaller shelf for the wooden water bucket and its accompanying drinking gourd. Rows of holed in other logs were for pegs upon which the pupils might hang their wraps. Some of these had portions of the broken pegs still in them. The split log benches used as seats for the pupils as wella s the larger one used for a recitation bench were no longer there, but he described them in detail. Mr. Harkrider told of the teacher’s desk and directed attention to the two holes in the wall above the place where it had stood. It was upon pegs stuck in these holes that the pointers and switches inseparably connected with pioneer schools once rested within the teacher’s easy reach. Mr. Harkrider stated that the windows, even then small, were larger than they originally had been. Careful inspection revealed that each of the two windows had been lengthened about fifteen inces at the bottom. It was apparent that nearly all the timbers in teh building were the original ones. Many, like some of the roof rafters, had been split out and others showed by marks upon them that they had been sawed by an up-and-down saw, like the one used at a nearby water mill that began to operate in the same year that the school was built. The visit of Mr. Harkrider was a rare occasion for those fortunate to be present. Many persons knowing the old house and its history naturally regretted to see its passing after 105 years. Before it was torn down, however, photographs were take and careful measurements were made. Using this date and the information given by Mr. Harkrider, by Mr. Will Owen who lived nearby, and by the writer’s father, who attended school there for a short time, a faithful scale model of the original building and its fittings was constructed.